Almost a year ago I gave up watching TV. With only minor exceptions I have avoided the giant glowing orb in our living room, having instead spent my time in other more high-brow pursuits (like writing a burger blog). But when I do break down and turn on the tube I tend to gravitate towards the lowest common denominator (i.e. Cheaters). These forays back into TV land never go well and I always end up redoubling my resolve, having decided that all programs must be this bad (especially since Joey Grecco replaced Tommy Grand as Cheaters host/staff psychologist, but I digress). After tonight, however, my mind has been changed. Last week while watching an episode of Man Vs Food (yes, it’s come to this…) I caught a glimpse of a burger whose toppings I have never seen nor imagined. Toppings that conveniently exist in my refrigerator 365 days a year, but whose combination and placement on ground beef has never even been considered. Host Adam Richman dropped by Duffy’s Cherry Cricket, winner of Best Burger Bar in Denver (2008), and among the 21 different toppings (and myriad of combinations) we catch a glimpse of what I am calling a “Game Changer” for burgers (at least in our house because I swear I have never seen cream cheese offered as a topping at any burger joint anywhere). What stared back at me from the screen was a humongous burger topped with a thick slab of cream cheese and a handful of chopped jalapenos. Oh yes, cream cheese and jalapenos on a burger! Where have you been my whole life? 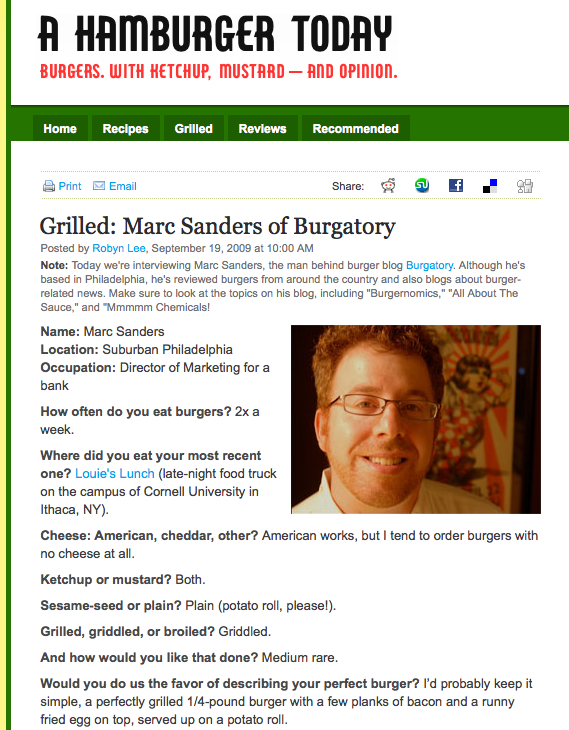 Cream cheese, like burgatory.com’s reigning best friend bacon, has the innate ability to “make anything better” and in this application is the perfect foil providing a critical antidote to the overbearing hotness of the jalapenos. We grilled our burgers inside and once we broke through the seared crust the cheese commingled with the loose meat, filling pockets of empty space with a blast of dairy to offset the beefiness of our 93/7 grind. As if that weren’t enough, the cheese hit the trifecta by matching the pillowiness of the Martin’s Potato Rolls. Denver natives have known about this topping combo for some time and according to the Cherry Cricket’s website, the cream cheese/jalapeno combo is the # 1 burger topping by a whopping margin. 80% of respondents called it their favorite, easily distancing such mundane fare as smoked cheddar and bacon or swiss and mushrooms. I worked briefly in the Denver metro and have extreme remorse recollecting that the only burgers I ever ate in the Mile High City were from Red Robin. But I can’t dwell on the past, especially because this one is so easy to recreate. I’d provide a recipe, but it is too simple to get technical. Just do what we did and open the fridge, pull out the slab o’ cream cheese buried in there, chop up your jalapenos and when the time is right, apply generously and consider the game changed.